Chakra, derived from the Sanskrit word cakra (meaning “wheel” or “disc”), refers to the areas of energetic clusters or an accumulation point of those energies in the subtle body. Before we continue, it is important to understand that chakras arise from the belief that our body is made up of subtle planes of existence that extended further than the physical plane. One example are the kosha energy levels (Image 1). A kosha, or “sheath”, is a layer covering the Atman, or Self according to Vedantic philosophy. 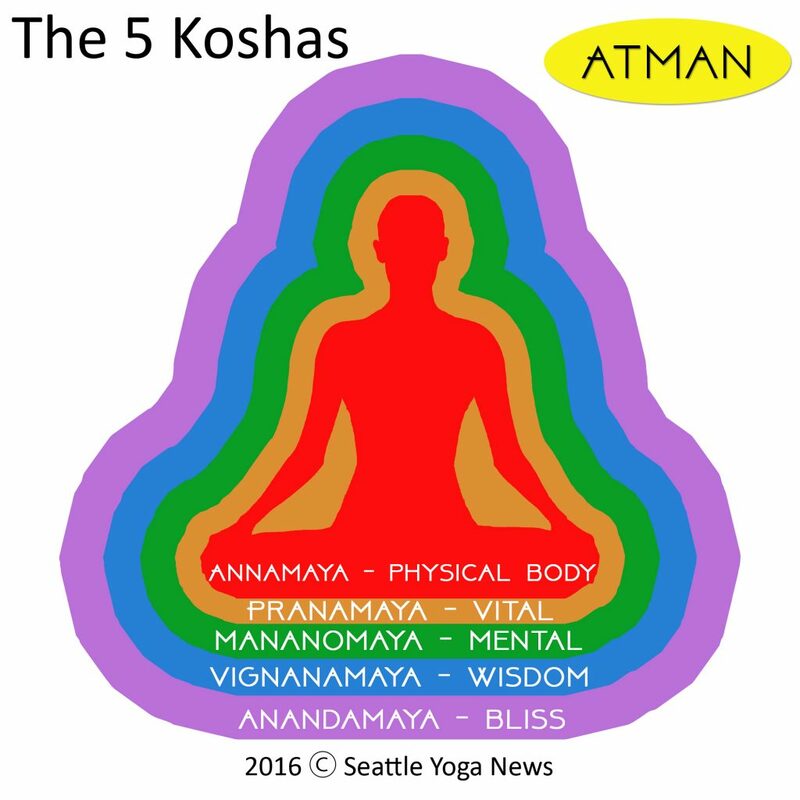 There are five koshas, and they are often visualized as the layers of an onion. This is important because, in the physical plane, it is hard, if not impossible, to see the chakras. If you were to use an x-ray machine or dissect a body, you aren’t going to find a physical representation of your seven chakras. Chakras live within the theory or belief that there is a more subtle plane of the body where energy lies and within that, exists the chakras. It is widely believed that there are many chakras in the subtle human body. In this series, we will delve deeper into each of the seven chakras that are considered to be the most important ones. Similarly to how understanding anatomy and the movements of the body assist with our ability to align ourselves in postures like chaturanga or headstand, understanding the chakra’s and how to wield our energy can help us to navigate and align ourselves within the landscape or our inner body. Understanding the chakras and how they operate can give us powerful tools for self-diagnosis and self-healing that will last our entire lives. What Makes Up a Chakra? Chakras are spinning vortexes of energy in the subtle body and are made up of an accumulation of the intersection of nadis. Nadi means “river” or “channel” in which prana or vital energy flows through the body. Ancient yogic texts, such as the Hatha Yoga Pradipika and tantric texts note that there are 72,000 nadis within the body, all believed to extend out from the spinal cord. Just like two rivers intersecting at a point creating power and spinning accumulation of energy. Where nadis connect, forms a wheel of energy or a chakra. Where are the Chakras Located? Of the thousands of nadis, there are three major nadis which play a role in where we find our 7 major chakras. These three largest nadis are called the Sushumna, Ida and Pingala nadis and they run or coil along the spinal column (image 2). Where these three major nadis intersect is where each of our 7 chakras are located. Along with the 7 major chakras, there are over 3,000 minor chakras. The chakras in the palms of the hands allow healing energy to move through them & absorb stagnant energy to be recycled. The minor chakras are present in joints, muscles & tissue; they also make up the meridian lines and acupressure points. The major chakras have lots of jobs to do & the minor chakras have smaller tasks to accomplish. What are the Seven Major Chakras? In chart 1 and image 3, the seven major chakras are depicted from the base of the spine up towards the crown of the head. The next 7 articles will depict each chakra in more detail. How Do We Balance the Chakras? It is important to understand that there is no ideal chakra balance. Each individual has a unique subtle body and individual energy currents that flow within their subtle body. Depending on the time of day, age, season, life circumstances, and more, chakras can move in and out of balance. Chakra balance doesn’t turn on and off but rather chakra balance can be understood by seeing what it looks like when out of balance. In each of the chakras we can fall anywhere on a spectrum from: Blocked – Deficient – Balanced – Excessive. Chakras that are not in balance usually are excessive (spinning too quickly, high velocity) or deficient (spinning to slowly, low velocity). For example, your root chakra may be cycling too slowly in which case it would be “deficient” in energy flow which will display deficient energetic characteristics. The chakras both work individually and a whole. For example, you can have a deficient root chakra while all your other chakras stay in balance. You can also have one chakra that is excessive while another is deficient and at times a chakra can exhibit both characteristics of excessive and deficient. In the next 7 articles, we will go into each chakra and learn more about what characteristics present themselves when a chakra is out of balance as well as in balance. As we go through each, the most powerful way to use the information is to look within your own life and how you are showing up on and off your mat. Once you see where you may be a bit off, you can use the tools of the chakras to welcome balance and healing into your life now and throughout the rest of your life. In the following Chakra Explained Series articles, we will explore each of the seven main chakras in depth as well as tips on how to align them. Mary Hazen started her yoga journey in 2009. With a background in competitive figure skating and dance, Mary immediately enjoyed the benefits of yoga and quickly made it part of her routine. Mary has completed multiple Teacher Trainings with CorePower Yoga and found great purpose and joy in sharing yoga with others. Mary loves creating thoughtful classes that provide an inspirational atmosphere for students to explore their bodies and minds. Mary is trained in power vinyasa, hatha, a restorative yoga techniques. A dancer from the age of 12, Mary specializes in vinyasa-style yoga classes that combine breathe with movement and flow like a dance.